Back to back challenges I guess. Hopefully this one is more clear than the last. 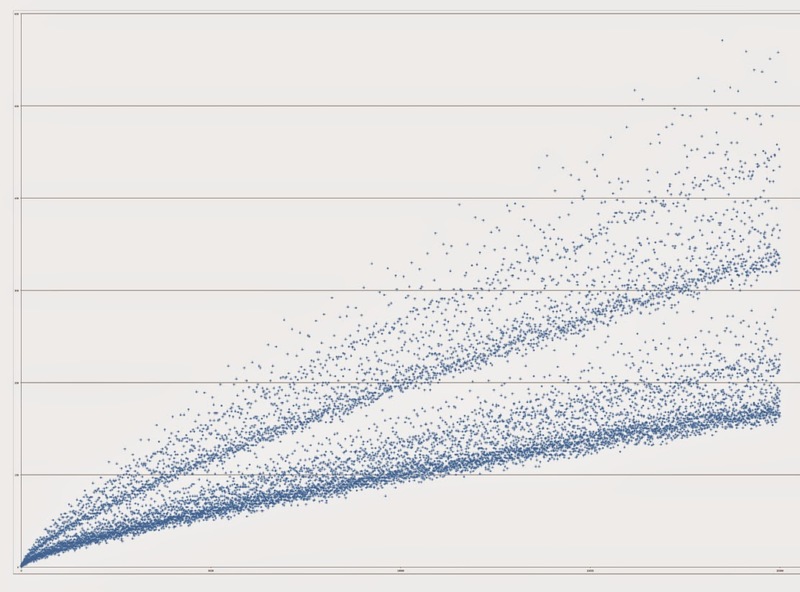 I was playing around with Goldbach's conjecture, and decided to plot evens (on the x-axis) vs the number of ways that two primes could be found to sum to a given even on the y axis. 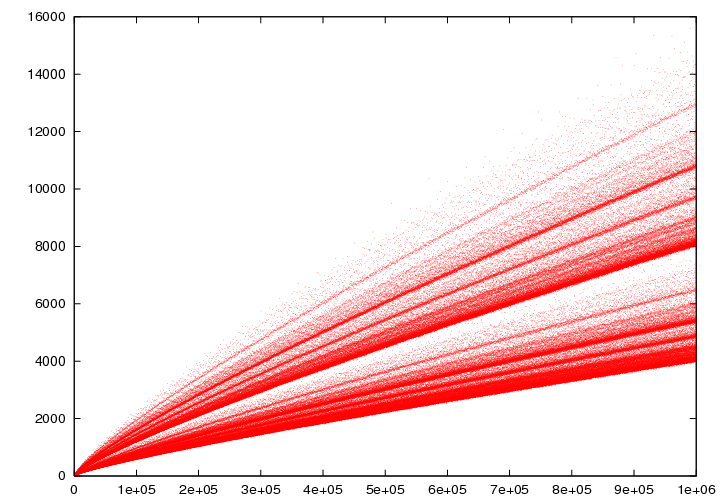 The two plots I've made below in Python are for 10,000 and 1,000,000 evens. The structure of these graphs is really fascinating! So I decided to go further and color different types of evens (those divisible by different numbers) different colors. What I found was that each band represented a set of evens divisible by some odd number, e.g., 3, 5, 7, 9. So that got me thinking of the following challenge. I would post the picture, but doing so might make this challenge a bit too easy, so I'll refrain till after I've crowned someone a victor. Define G(x) to be a function defined on the positive evens which returns the number of different ways to sum two primes numbers to form x. Note that the primes are indistinguishable, i.e., 3+5 and 5+3 are considered equivalent. Your score will be the integral from 0 to 10,000,000 of (f+g+h). Each submission must not only include the formulas for all three of these functions, but show through code in whatever language they see fit that the conditions of the challenge are met. Each submission must also calculate the integral of their score. This can be done in a separate language if so desired by the user (or by hand if you are a masochist). Once a submission has been made, any submission whose score is not at least 5 points higher than the previous submission will not dethrone the current winning submission. I don't have much reputation, but I'll put up a +50 bounty for first place, along with a +15 for accept. This is somewhat of a new type of challenge for this site, so enjoy! Considering the poor reception this problem has received, I will no longer be offering a prize for this problem. However, I'm working on designing another one, which hopefully will have a prize associated with it! Browse other questions tagged code-challenge primes calculus or ask your own question. Get thee behind me Satan-Prime!